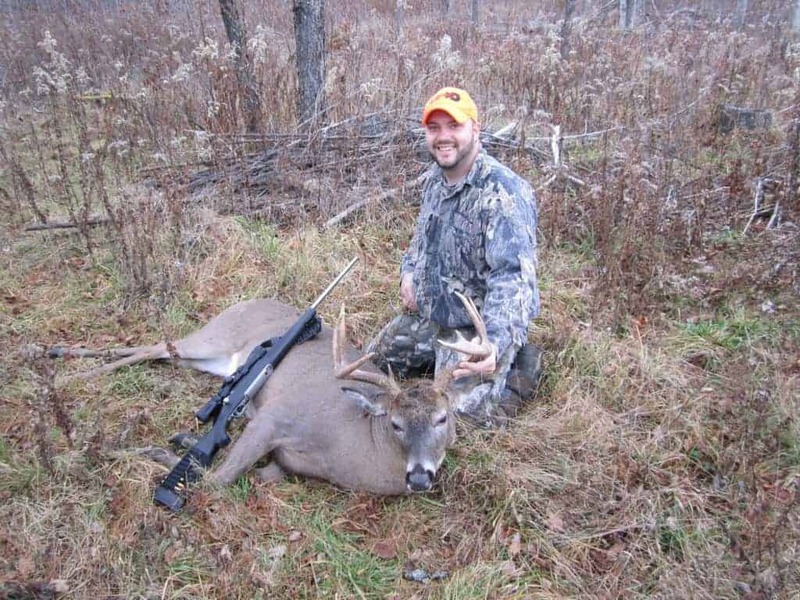 Guest Post by Dave Hutchinson: The Buck of a Lifetime! - the4pointer.com | Real Hunts. Unreal Stories. Guest Post by Dave Hutchinson: The Buck of a Lifetime! I don’t think this story needs much of an introduction…just look at the picture! 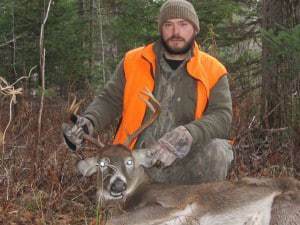 Congratulation’s on your buck of a lifetime Dave! The Buck of a Lifetime! 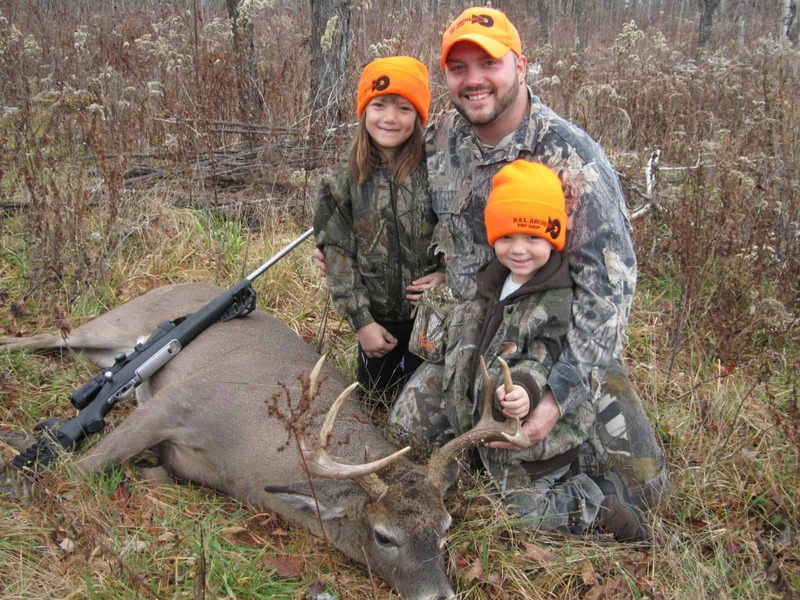 Dave Hutchinson with his daughter Meliah, age 8, and his son Garrison, age 4. With the opening of VT rifle season brings me much anticipation and busy days working at R&L Archery, helping central Vermont hunters get what they need from ammo to licenses and everything in between. Knowing that I had to work opening day of rifle season didn’t give me much time to hunt in the morning except for maybe a couple of hours. But as any Hunter knows, it only takes 20 seconds to make something happen, so I planned for a 2 hour sit before work Saturday morning. I was already off to a good start to the 2013 season. I drew an archery moose tag and was able to fill that tag with a very nice bull moose I called in for a 5 yard shot with my bow. Then, I got a nice 4 pointer during VTs archery season and a nice 7 pointer from Ohio with my bow. I really didn’t think I could get anymore lucky! 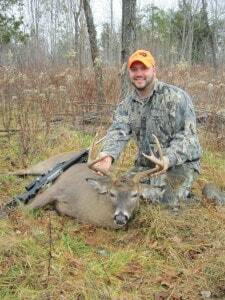 Dave’s brother Robert with his opening morning 8 pt. asked if he needed help seeing this was his first deer. I got back “Hell yah!” So I thought to myself “Do I sit or go help my brother? Go help my brother!! !” I got down out of my stand not caring about any deer that were remotely nearby and ran back to the house and got in my truck! When I arrived at the spot where my brother was hunting I found him standing by his truck with a big smile. We walked into his set up where he told me the story about his first deer. Upon walking up to his deer I quickly realized that it wasn’t a small buck but a very nice 8 pointer! With a shake of the hand, followed by a hug, I congratulated my brother on a job well done!! After teaching him how to field dress a deer for the first time we were headed to the check in station and me to work! Helping my brother with his first deer was better than if it was my deer. Results at weigh in 8 pt 149lbs!! Congrats Big brother!! It was a rough day at work seeing all those wonderful deer pour in to be weighed and checked in. I told myself I could probably sneak an hour of hunting in tonight if I could slip into my stand undetected, so that was the plan for the end of the day! Well the end of the day came and for some reason I thought I should wait and just hit it hard on day 2 and go home and relax. With the sound of my alarm clock going off I jumped out of bed with excitement! I wanted to get out to my stand before daylight and put some scent out around my set up. When I arrived to my stand I took the can of Tinks 69 Hot Shot from my pocket and sprayed some wicks and some trees with doe estrus. I climbed into my stand quietly and settled in for the morning hunt. After only 10 minutes I could hear the deer running the ridge again, same as on day one but this time my phone was off! Quietly listening and waiting for more daylight my eyes were peeled, picking apart the woods. Within minutes I heard a faint grunt and my heart jumped. I grabbed my bleat can and hit it 3 times to have a buck grunt back 5 times! “Game on!! !” eyes locked in the direction of the grunts I saw the deer cruising through the slash. Looking through my bino’s I could see a large main beam on the deer’s left side. “BUCK! !” I told myself! With more observation I could see 3 points on one side and said to myself “It must be the 8 pointer I have pictures of! !” I hit the grunt call once and that seemed to tick him off!! He pawed at the ground and raked some trees while making some short grunts! “Wow this is a good one” I told myself. Within seconds he turned to go back to where he had come from, walking with his nose down. I had one shot window and as he stepped into it I squeezed the trigger! Boom!! With the sound of the Savage 116 30-06 I lost sight of the deer! My mind was racing, did I miss or did I drop him right there? After calming my nerves I grabbed my binos and began to pick apart the trail he was on. While looking I saw a doe walking on the other side of the apple tree at the base of the trail. She walked the path the buck had been on and stopped 10yrds from where he was standing. She was looking at the ground and moving her ears back and forth. It was then I said to myself, “He must be down right there!” I watched the doe for about 20 minutes until she fed out of sight. By then I’d had all I could take! I got down and walked down wind of where I shot him not knowing if he was dead or still alive. While walking closer and closer to the kill sight I was getting more excited. Then I could see a deer’s backside lying on the ground! “YES, I GOT HIM! !” I yelled, with a fist pump! Running up to him I quickly realized that was not the 8 pt I thought he was but a much bigger 9 pt!!! I almost fainted!! “Holly Crap he is huge! !” I said. I took one look at him and said I need to call my brother! So I ran back to the house to call him. While home my son Garrison (age 4) and my Daughter Meliah (age 8) asked if they could help! I said sure why not!! I told them to get dressed and get their hunter orange hats. With a call to my brother he was on his way! I fired up the 4 wheeler and gave the kids a ride up to the deer while my brother followed behind. The kids and my brother were so excited to see the deer. Amidst all the excitement we took the pictures and got the amazing buck out of the woods. This was a Buck I haven’t seen before but I will get to enjoy the rest of my life! This is a Buck of a lifetime for me in more ways than one! It was an awesome finisher to my 2013 season! 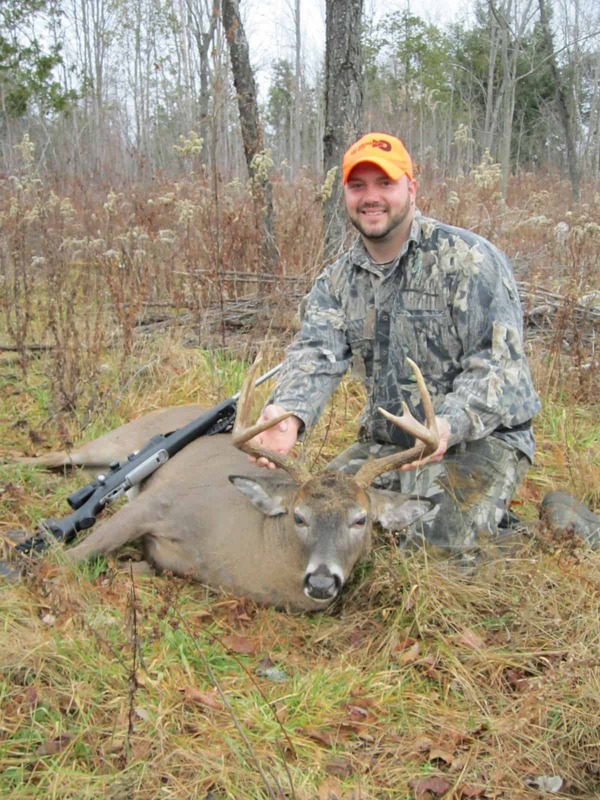 Final results after reporting – he weighed 160lbs and was a 9 pointer He green scored 117″ of antler. My biggest buck to date and my buck of a lifetime! !